Robert Khan and Tom Salinsky follow their 2012 play Coalition with Making News, an entertaining satire of the BBC. The Acting Head of News has recently been replaced by Rachel Clarke (Suki Webster) following an scandal. 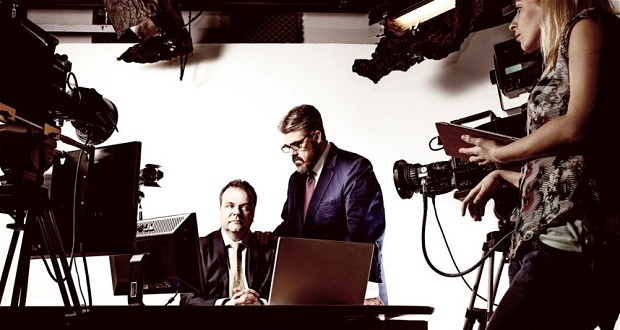 She is soon faced with the dilemmas of reporting that the BBC’s own website has been hacked, and that the Director-General (played by Coalition alumni Phill Jupitus) has been funding a cult with licence payers’ money. There are entertaining performances, particularly from Hal Cruttenden as news reader McVeigh, who is thrown in at the deep end. An unfortunate consequence of Sara Pascoe‘s realistic portrayal of down-to-earth producerAnna Kelly is that some of her lines are not quite as audible in the huge Pleasance One than as some of the the more exasperated characters, such as Dan Starkey’s news editor. There are obvious comparisons to be made to Drop the Dead Donkey: “You have my full support” is pure Gus. There were opportunities for more direction; for example, it took a while to engage with Liam Williams, as Panorama reporter Noel Quickly, because he spent a little too much time addressing other characters with his back to the audience. One of the main benefits of the way which the BBC is funded is that it increases the volume of public discourse about media industries, ultimately helping to increase transparency. Making News hints at some of the scandals Auntie has had to deal with in the last few years, leading to some jokes by way of exophoric reference. It acknowledges the BBC’s role as a pawn in political games; as the Conservatives complain of its ‘lefty bias’, while Labour attack the corporation’s connections to the Establishment; this was illustrated perfectly in April, when left and right equally complained about the coverage of Thatcher’s death. There were some nice ideas, such a visually-interesting sequence about the moral and ethical dilemmas is reporting fraud at the very top of the BBC. McVeigh’s interview with the DG evoked Noises Off, though, thinking of Steven Moffat’s Coupling, the scene might have enjoyed even more ambitious comic staging. Not flawless, but great performances and a fun acknowledgment of the political and bureaucratic tightrope the BBC has to tread.